My visit included tours of the original factory in Belgium and Ecover’s newest factory near Boulogne-sur-Mer, France. Entering the factories, it feels more like you’re entering a cathedral than a cleaning products production plant. Building materials are predominately recycled and recyclable, and factory waste water is recycled and returned for use in the factory using a windmill pump. In the original factory, the grass-covered roof has insulating properties which saves energy and supports a wildlife garden. The roof was included by the architects as a functional piece of the designs. The factory also included grass banks and reed beds around the factory to help it blend into the countryside. 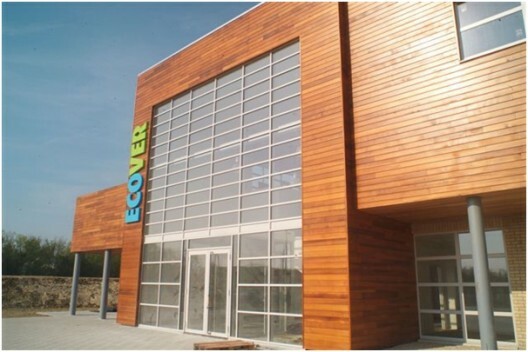 Inside, Ecover has been hard at work developing the future of eco friendly cleaning products. I was also able to preview their new products for 2009. Ecover’s refill system, which accounts for over 91,000 litres of refill a year saving tons of plastic going to landfills, is being re-launched in a more ecological and cost effective “bag-in-box” format – sort of like box wine! The new refill system features lighter packaging and less spillage and waste, a big improvement perfect for home or office/small business use. Ecover has also reformulated its range of hard surface cleaners with pioneering biosurfactant ingredients. Biosurfactants are what make Ecover products uniquely ecological because they are produced through a biological process rather than a chemical one. Products are manufactured from vegetable oil (rapeseed) and glucose (sugar) by bacteria or yeast. The new formulations have been 7 years in the development and are fully renewable, biodegradable, low in toxicity, and involve reduced transport of ingredients. The new hard surface cleaners carry the Good Housekeeping seal of approval and claim to clean as effectively as non eco brands such as Flash. How good are they? We’ll let you be the judge! The new Ecover hard surface cleaners, and the new refill system, will both be available at EthicalSuperstore.com, early in 2009.